This page gives a brief guide to how to access Asahi Net's on-line Account Maintenance pages. On our Account Maintenance pages you will see this icon against the options that can be performed on-line. Click the icon to log in to the on-line account maintenance page. 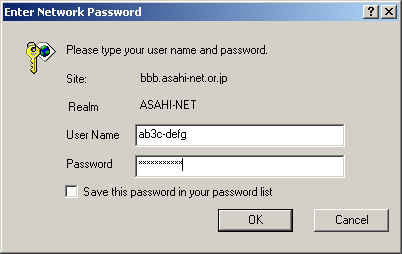 You will be prompted to log in with your Asahi Net User ID and its password. The following mistakes are common. Please avoid them! Do not add "@atson.net" to your User ID when filling out the User Name box. Do not add "@asahi-net.or.jp" to your User ID when filling out the User Name box. Do not insert "i." or "I." before the User ID when filling our the User Name box. Do not have any empty spaces before or inside your User Name or Password entry. Do not enter your User Name or Password in a language other than English. Do refer to the User ID Notification sheet sent to you and ensure that you are not mistaking the number "1" for the letter "l", or the number "0" for the letter "o". After logging in, follow the on-screen instructions for the option you have chosen. Sometimes the data you type is checked for errors - if you see an entry highlighted in red, you may need to correct it before you can proceed. When you complete an on-line process, such as making an application for a service, you will see a confirmation number. Please take note of the number as you may need it later. If you have forgotten your User ID, but you know your password, you can just call us during our office hours, and we can tell you your User ID. If you have forgotten your password, we will have to make you a new password and post it to you: we do not keep copies of member's passwords. Thank you for visiting the [How to make the change on-line] page of Asahi Net, the Internet provider.